While much of the discussion surrounding DMT revolves around N,N-dimethyltryptamine, it’s close relative 5-methoxy-N,N-dimethyltryptamine (5-MEO-DMT) seems to be gaining interest in recent times. 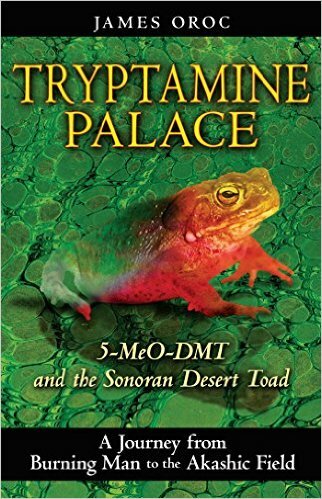 James Oroc would author a book titled “Tryptamine Palace: 5-MeO-DMT and the Sonoran Desert Toad”. In this book, Oroc would summarize his experiences with 5-MEO-DMT and his speculations as to what role it plays within the natural world. It’s a compelling book and gives insight into the lesser known of the DMT’s. While DMT experiencers across the world have been describing their interaction with the molecule for many years now, it is a rarity to hear a story that truly boggles the mind. Obviously stories are stories and cannot supplant “scientific evidence” but sometimes they can operate as a catalyst to previously suppressed insights. This story by James Oroc does just that. “This 5-MEO-DMT experience began at close to midnight on October 30th in New Orleans, in a neighborhood famous for its association with Haitian voodoo. I was with an old friend, Rene, a middle-aged Canadian woman long experienced in the ways of the counterculture, having spent many years in California and having worked as a photographer with the Grateful Dead for eight years. She had smoked 5-MEO-DMT once and was keen to do so again, but she was happy for me to lead the way. Rene doesn’t smoke weed, had not been drinking, and thus was completely sober at the point when I inhaled 5-MEO-DMT while sitting cross-legged on a couch opposite her. On this occasion I sailed through the usual progression of steps, and I remember hitting the stage during the enormity of the knowledge and the timeless nature of my environment usually would frighten me into a return to my physical form. I recall opening my eyes at that point, and in an unusual moment of physical clarity, I saw that Rene was sitting across from me meditating. I felt that everything was okay, sailed straight through that stage (which is usually my peak) and burst into a realm that can only be described as pure light. But this was not ordinary white light, nor even the white tunnel that I dissolve into when I exhale from a 5-MEO-DMT hit; instead, it was a fractal-filled prismatic light of indescribable radiance and beauty that pulsed with its own intelligence. I remember this all with remarkable accuracy. I then felt a strong sense of the presence of my friend Brigid, who had died several years earlier. I had loved Brigid very much, yet realized I had not thought about her in quite some time, perhaps because my thoughts had been overwhelmed by my fascination with my "new” world. But now she was clearly in my consciousness and it was much more than a sense of simply remember her. It was as if we were walking together, hand in hand, through towering shadowy trees on a field of stars, and she was laughing, her smile radiant. This was not a memory, but a feeling of actually being there with her. At this point Rene came over and sat down beside me where I lay and gripped my arm quite hard. I realized that her face was covered with tears. “There was a women in the room,” she said, as she wrung her hands with her eyes closed, seemingly occupying some place between two worlds. “She was young and beautiful. Oh, she seemed like she was so much fun. She was laughing. And she wanted to tell you that she was sorry she did not get a chance to say good-bye. And that she loves you. She is still here, but she’s fading away.” Rene went on to accurately describe my dead friend’s appearance and personality, though she did not know her at all. She was obviously agitated and very emotional. It was as though she had taken some kind of a drug, and it took many hours before she completely “came down”. Rene’s version of events went like this: After I exhaled the 5-MEO-DMT, she saw a beam of light the size of an American quarter come out of my chest. When I split into two perfect copies of myself, sitting side-by-side on the couch, she found it hard to believe what she was seeing, being completely straight at the time. She said that even though she opened and closed her eyes, and rubbed them, the vision continued, apparently for a period of several minutes. After a while, she decided to close her eyes and meditate, since the whole affair was freaking her out a little. This is when the spirit of my dead friend suddenly appeared: an encounter Rene described in convincing detail. Rene is a mother with a grown son, and she was completely sober during my trip. But if you had walked into the room while she was relating what had happened, you would have sworn that she had taken some kind of a drug and that I was the sober one. She has had considerable experience with people on all kinds of chemicals during her fifty-plus years on this planet, and yet it is safe to say that she had never experienced anything like this before. It is worth mentioning that Rene has lived in California for some years, and she is receptive to various “New Age” concepts-far more so than I am! She has had other “channeling” experiences and comes from a long line of women known to possess fey powers. So she was later able to take the whole bizarre metaphysical occurrence somewhat in stride. At this point we can only speculate upon the biological mechanisms that might have taken place in order for this to occur. In 2005, the journal Medical Hypothesis would publish a paper describing the activities of heart torsion and the heart’s electromagnetic field. The write-up would state: The heart produces a magnetic field in the body due to the organized electrical depolarization and repolarization of cardiac myocytes. The heart produces the largest magnetic field in the body at 50,000 X 10(-15) (Tesla) compared to the brain signal of only a few 10(-15) (Tesla). A 2000 study in the journal Clinical Neurophysiology would showcase the variations in heart rate variability (HRV) that arose from magnetic field exposure of 16 Hz during sleep. The conclusion was as follows: Magnetic field exposure in the EEG/MEG beta1 frequency range alters HRV via a central nervous system (CNS) effect. Phase-resetting experiments rule out a direct effect on the cardiac pacemaker. Biophysical calculations of the intensity of the electric fields induced in brain versus heart under the present exposure conditions are also consistent with and support a central rather than a peripheral site of action. A 2002 study published in the International Journal of Neuroscience would showcase the effects of high-frequency electromagnetic fields (EMF) on the the human brain via EEG measurements. The results showed that there were definitive differences in brain activity from EMF fields. 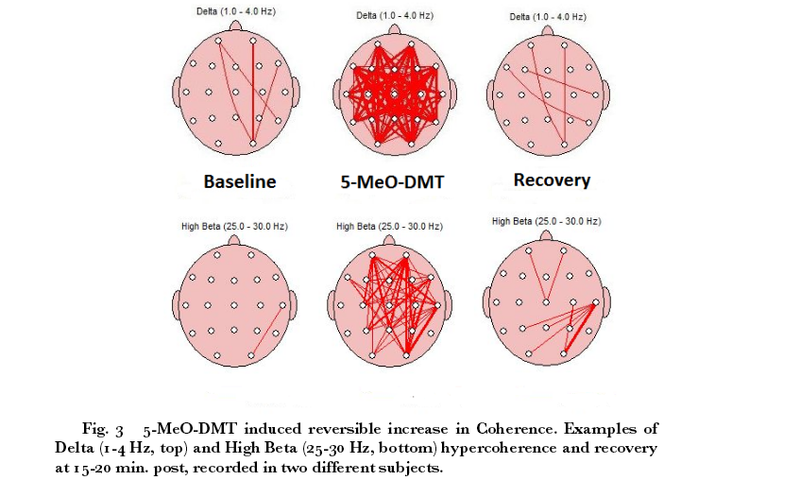 In an earlier piece titled “The Heart-Brain Connection & DMT, we present some information regarding the perceived communicative effects of the heart and brain. We also outlined the strange occurrences of memories generated from heart transplants for the recipient. Without going into too much speculation, it would seem that James Oroc’s story is comprised of him activating a neuron or set of neurons in the heart associated with his friend Brigid via the ingestion of 5-MEO-DMT. As he does so, the signal from the heart travels to the brain inducing global hyper-coherence in the brain via gamma waves. This in turn would generate a specific and significantly powerful electromagnetic field emanating from Oroc that would strongly influence the heart rhythm and EEG of his friend Rene. In doing so, Rene would then experience some overlap with the visualization that Oroc was experiencing. In essence… they "synced-up”. I’d presume that although Rene hadn’t ingested any mind altering substances, perhaps the fluctuation in her own EEG and heart field/rhythm could potentially release her endogenous DMT/5-MEO-DMT. Below is the EEG data of exogenous 5-MEO-DMT administration presented in the journal Cosmos & History. The study would showcase a distinct increase in high beta/gamma waves as well as increased coherence. What we attempted to surmise are the biological correlates to the experience. This is not an attempt to reduce the experience as pure hallucinatory phenomena as Q4LT is in no position to do so. It’s a difficult case to crack as it’s a story that is extremely difficult to replicate in a scientific setting. The description of the story brings up topics such as telepathy and afterlife. It definitely appears as though information was transferred outside of the 5 senses. If you incorporate the distinct electrical changes in direct current (DC) direction during altered states of consciousness, it might provide some insight as to how the information transfer occurs. If you also add in the recent development of inductive charging (wireless charging) which utilizes an electromagnetic field to transfer energy between devices, the notion of “telepathy” becomes a bit less ridiculous. Only a camera would be able to have verified whether Oroc emitted a beam of light from the center of his chest during the experience. The same goes for the spirit of Brigid appearing in the room. Once again, there is the possibility that a camera that is capable of capturing a specific frequency of light would be needed for this endeavor. Perhaps we can find some answers somewhere along the infrared spectrum… I really can’t say. The concept of the afterlife is unbelievably complex. Since the beginning of time civilizations across the world have believed in the existence of an afterlife. Somehow that concept has been lost in modern times as we lack the clinical “proof” of this possibility. This could possibly be more of an equipment issue than a reality issue much like the undeniable existence of billions of planets billions of light years away prior to the invention of the telescope. The same can be said for the existence of DNA long prior to the development of the microscope. Our perceived “knowledge” of the world in a scientific sense is only hampered by our advances in technology. I hypothesize that we are living in a severely DMT deficient society when compared to our ancestors. Either we “hallucinate” less in modern times or possibly have less access to greater truths as a result of this. There is also the outside chance that abilities deemed as “supernatural” or “spiritual” such as telepathy coincide with elevated levels of our endogenous “hallucinogenic” compounds. Only time will tell what is what. In any case, this story from Oroc’s “Tryptamine Palace” is definitely a story to ponder and leads to even more questions about the role of DMT, 5-MEO-DMT, & Bufotenine within the human body.